My dad is a HUGE fan of pretty much anything cherry, but especially cherry cheesecake. So when his birthday party came around this past year and I was deciding on menu items, this made the top of the dessert list. Well, along with his birthday cake, too. I don’t know what it is about bite size cheesecakes…maybe it’s because you feel like “Oh, these are so little, they’re not going to be that bad, I won’t feel guilty for eating one…” And the next thing you know, you’ve eaten six of them, and trying to reason with yourself that you only ate six of them, they’re so little. They don’t have THAT many calories, do they?! These little guys are SO cute…but not too cute to eat! They were gobbled down before, during, and after the party. When I made these, a couple of utensils made the process much easier than usual. A wood tart tamper is perfect for pressing the crust in the bottom of the pan, and the mini scoop worked out wonderfully when distributing the cheesecake batter as well. If you don’t like cherries as a topping, feel free to use whipped topping, chocolate, caramel, nuts, etc. 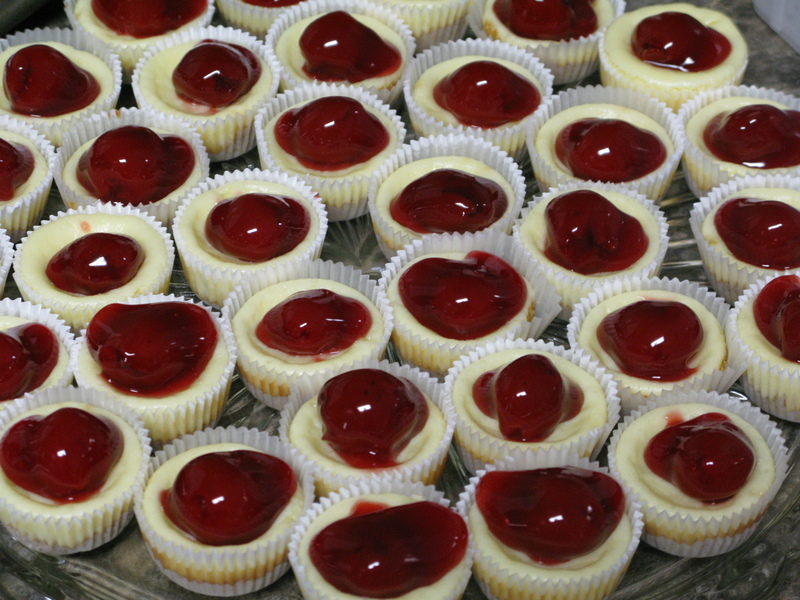 In fact, do them with different toppings to give your guests options to choose from! Combine first three ingredients, and drop 1 teaspoon of crumb mixture into lined mini muffin pan (this batch makes 48). Beat cream cheese and sugar at medium speed with electric mixer until smooth. Add remaining ingredients, beat until smooth. Using mini ice cream scoop, distribute batter evenly between liners in pan. Bake at 350 degrees for 15-17 minutes. Cool completely, top with pie filling, store in refrigerator.